A majestic men's sapphire ring with an oval sapphire gem in the center and a trillion cut gem on either side. The buyer of this ring wished to have a sapphire and ruby gold ring but, the price of the jewel with these two precious gems went beyond his intended budget. After discussion with the Kai Silver support team all synthetic (man made) gem options were ruled out, it was decided to go with rubelite. The buyer was given a clear explanation regarding what exactly was meant by rubelite, this gem is not a variety of ruby. Tourmaline when it has a pinkish red color, is referred to as rubilite. Our artisans crafted the ring with custom cut gems and the buyer was thrilled to see the final result. The blue sapphire gemstone in this ring is a natural good quality gem, a medium grade option that we also provide, would give a much milder price point. The 9x7mm oval blue sapphire in this ring is firmly bezel set and mounted horizontally, a vertical mount is also possible but would, increase the dimensions and metal weight of the ring. The gemstones on the sides are 6mm trillions, handpicked and custom cut to ensure a perfect match. When you talk about a men's ring, the design elements depend on personal preference but, there is one feature that remains constant and should never be compromised. We refer to the durability of the jewel, the fact is that men never seem to take sufficient care of the jewelry and accessories they wear. We have seen men obsessed with their 1,000 U.S$ watch but, they seem to care much less about their 5,000 U.S$ diamond ring! Keeping this in mind we at Kaisilver, have always research men's jewelry to have inbuilt features to enhance the durability of the jewel. Minimum weight is 22-25 gms for the gold ring and 18 to 22 grams for the silver ring. Healthy metal weight ensures that the ring cannot bend or deform easily. All gems are firmly held with bezel settings, prongs tend to stick in pockets and gradually open up. The bezel setting for the gems also protects the gem borders from side impact. The ring is built strong even on the portion behind the finger with a 6mm width. The gems do not protrude far beyond the ring surface, this prevents gem damage by impact. The important thing about this men's sapphire ring is that, it is fully custom made - this means that every feature in this men's ring can be personalized to your liking. The gemstones for the center and sides can be selected by you, it is also possible to modify the design concept and make a men's ring with just one center stone and no side stones. With Kaisilver's direct access to the world's largest gemstone resources which include more than, 200 million carats of cut and polished gems, your gem selection need not be limited to what you see on our website. We have had many orders where the buyer requested for the same ring to be made with a uniform band width, most probably to be worn as a men's wedding band ring. This does entail a slight increase in metal weight and our team will let you know, if that would incur an increase in price. The quality of craftsmanship and gems remains the same for both gold and silver men's rings, so choose the metal based on your budget and liking. While we can do white rhodium, yellow gold or rose gold plating for your silver sapphire gemstone ring, you should know that plating done on 925 silver will always wear off after a while. 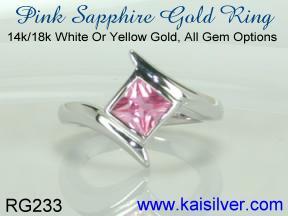 Though shown as a yellow gold mens sapphire ring, you can choose 14k or 18k, yellow, white or pink gold for your order. Custom made in gold or 925 silver, both options have same quality of workmanship and gemstones. 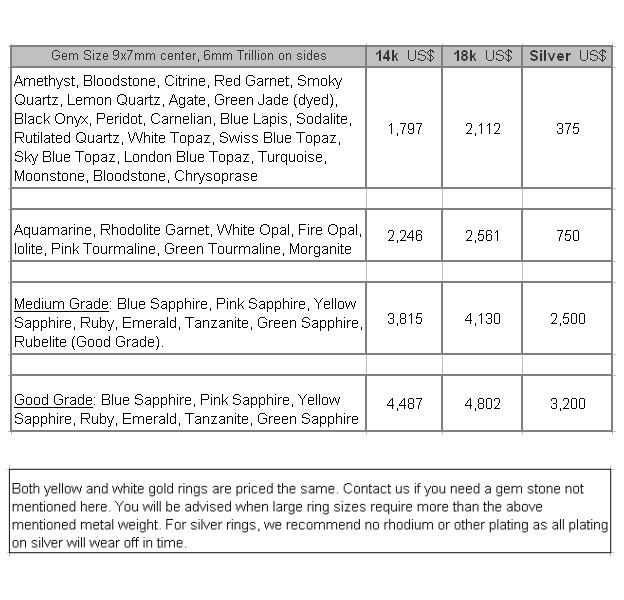 All gem options available, not limited by what you see on the website. Gold ring available in 14k, 18k yellow, white or rose gold, minimum metal weight is 22 to 25 grams. Request for a price quote if you need your men's sapphire ring to be made in 10k gold. Recommended that sterling silver ring be left unplated but, white, yellow or pink gold plating possible. Any plating done on the silver sapphire ring will wear off after some time. The silver sapphire ring has a minimum metal weight of 18 to 22 grams. Custom made in all ring sizes, large sizes might call for more metal weight. Ring features can bepersonalized according to your liking. Request if, you wish to have a solid ring with no scooping inside the band. Portion behind the finger is 6mm wide. Center gemstone is 9x7mm oval, side gems are 6mm trillion. Kaisilver: We are the online pioneers in crafting high end custom jewelry, over 12,000 quality conscious jewelry lovers across the globe rely on us for all their jewelry requirements. All jewelry is custom made in gold or 925 silver, the design, dimensions, metal and gems are selected by you. We welcome your own designs and concepts to be custom made, you can also pick a design from our website and request for it to be made in gold or silver - all features can be personalized as per your preference. With gem procurement expertise that extends to almost every gem mining location in the world and direct access, to more than 200 million carats of cut and polished gems, we place no restrictions on your choice of gemstones. Pricing For The MAN54 Based On Metal And Gems Selected. Buying: We do not believe in the concept of 'click to buy' online sales as, high end custom made jewelry requires more of a personal touch. Contact our experts at sales@kaisilver.com with questions and requirements, you can even send images of your own designs to be custom made. Once you have communicated the design, metal, gem choice and other details, you will be provided with a detailed reply along with a price quote for your requirements. Do not hesitate to ask more questions and get complete answers, we are in no hurry to push you to buy so make sure that all your doubts and queries are cleared. Payment: Once you are clear about what you would be getting for what you pay, move to the payment process and order confirmation stage. At Kaisilver we accept payment through Paypal and Western Union but, do not recommend Western Union for first time buyers. You can let us know which mode of payment is best for you and we will provide details for the same. Shipping: Production is 4 to 6 weeks from the date of the order being confirmed and we receiving payment. Your merchandise will ship through FEDEX, you will receive the tracking number the moment the shipment leaves. There is 35 U.S$ shipping charge to be added to the above prices. A finely crafted white gold pink sapphire ring, celebrating the sapphire in one of it's rarer colors. Crafted in gold or sterling silver, with your choice of gemstone ... more. 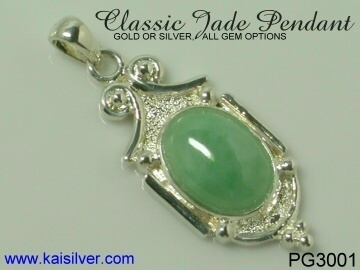 A classic timeless look for this gold or 925 silver jade pendant from Kaisilver. Available with a range of gem options. Can personalize gem shape and size too ... more.